For the American author and poet, see Susan Brind Morrow. 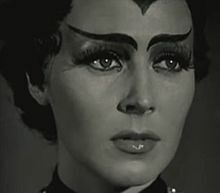 Morrow in Cat-Women of the Moon. Susan Morrow (born Jacqueline Ann Teresa Bernadette Immoor, May 25, 1931 – May 8, 1985) was an American actress. Born as Jacqueline Ann Teresa Bernadette Immoor to Frederick W. Immoor and Katherine (Shea) Immoor, Susan Morrow was the elder sister of Judith Exner. Morrow's screen debut came in Gasoline Alley (1951). She co-starred with Charlton Heston in a 1952 western film, The Savage. Her television career lasted only six years from 1954-1960. Among her appearances were two 1955 episodes of The Loretta Young Show, three 1957 episodes of Gunsmoke starring James Arness, and a 1958 episode of Perry Mason as Arlene Dowling in the title role of "The Case of the Sun Bather's Diary". In 1960, her three final appearances were on the westerns Bronco, Maverick, and Lawman. Morrow was the first wife of comedian Gary Morton. They were married on December 17, 1953; the marriage was annulled on July 11, 1957. She remarried twice. Her second marriage was also unsuccessful, but her third, to Clarence Sheldon Attix Jr., on July 4, 1963, lasted until her death, and they had four children. Morrow died in 1985, aged 53. ^ "Susan Morrow - The Private Life and Times of Susan Morrow. Susan Morrow Pictures". www.glamourgirlsofthesilverscreen.com. ^ "Lead in First Role". The Salt Lake Tribune. Utah, Salt Lake City. November 9, 1950. p. 27. Retrieved December 2, 2017 – via Newspapers.com. This page was last edited on 30 October 2018, at 01:46 (UTC).